The encoding and enrolling of learner to his respective school through an online site created for this purpose, the Learner Information System have been done by all the public schools, both in elementary and secondary in the Department of Education here in our country PH. Though some online users found it taxing on their part for some internet glitches which couldn't be remedied immediately. Some have to work it until the following morning just to beat the deadline. Actually what can you expect from those novice, neophytes as far as cyber job is concerned? Imperfection. Trial and error. Trivial queries or a mere or utter curse of the system which they admit is very new to them. Anyway, what else can we do? Charge it to experience. What about the masterlist? They want a copy of it but the system doesn't provide the facility or function to furnish them a copy. It is not a problem anyway. Individual class section in Learner Information System is easy to print out. There is a function provided for that service. 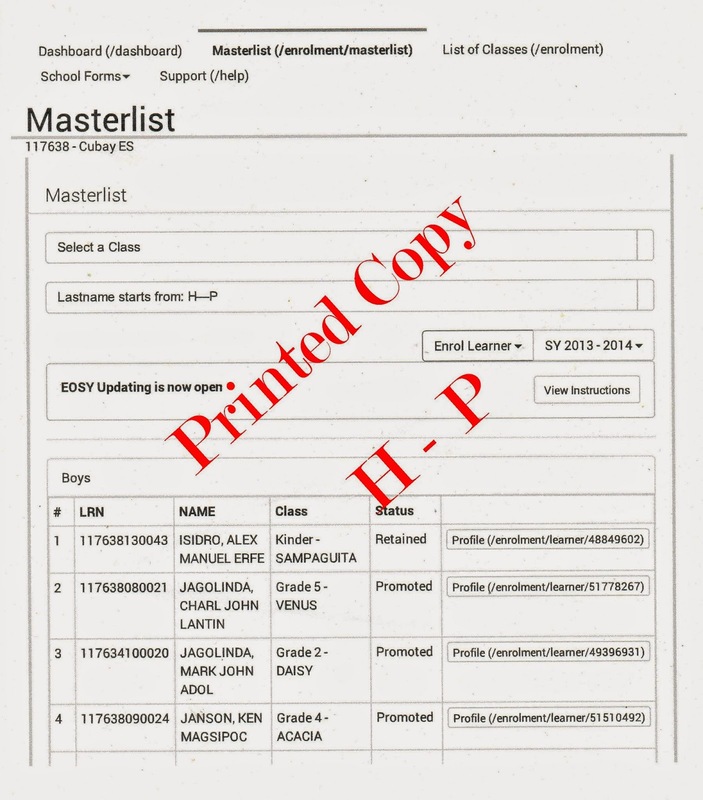 Teachers, school heads have regarded a problem in printing out the masterlist of their respective learners. I know they want those lists for their ready reference. Well, if they're resourceful enough, that list they need could be easily printed out. 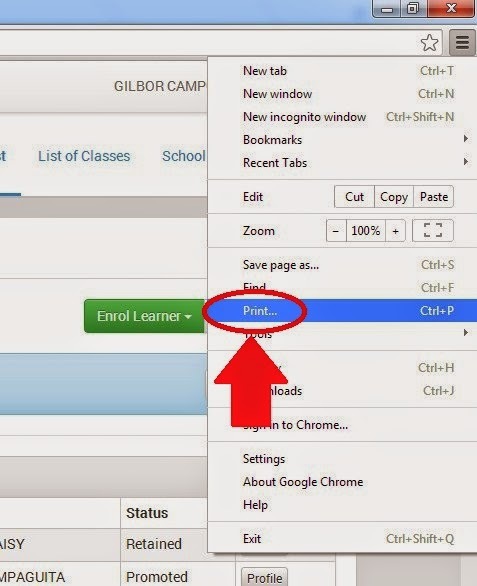 Take your time to follow this simple tutorial in printing out the masterlist of your learner direct from your dashboard through a Google Chrome browser. 1. 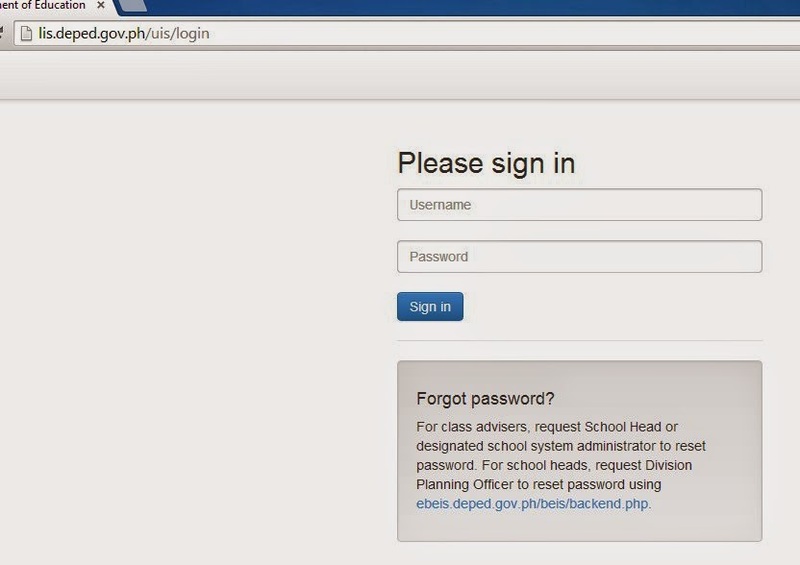 Log in to your school LIS account. 2. In Dashboard, click Masterlist. 3. At the upper right hand corner, just below x button, clcik 3-bar box icon. Then various function buttons will be displayed. 4. Then click print. You will see the print area. 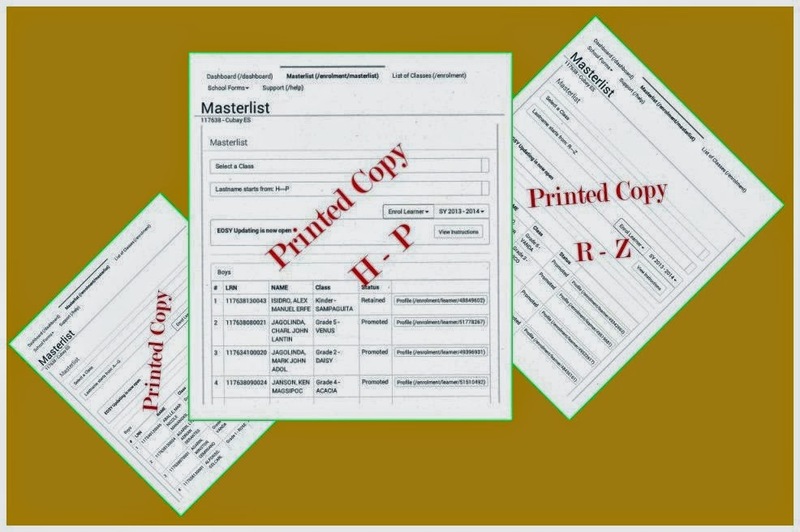 The number of sheets of paper, the printer destination, among others are displayed. 5. 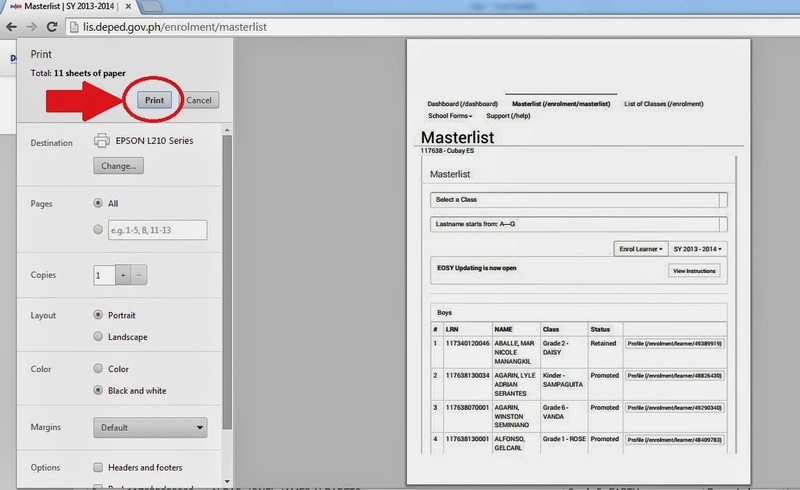 Finally, click the print button to print out the selected Masterlist of Learner. It is being grouped as A - G, H - P, and R - Z. 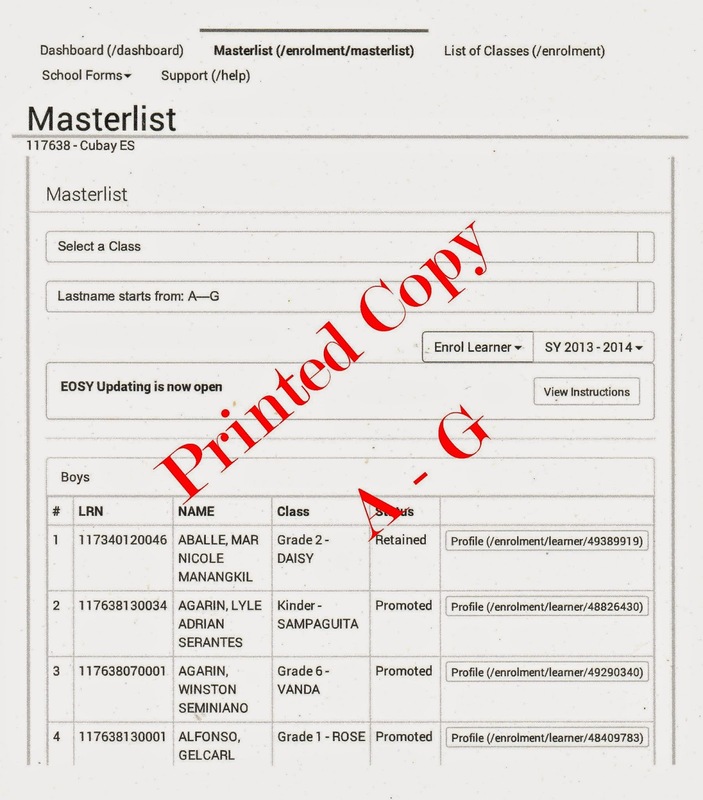 Now, you're complete with your list of all your pupils/student printed out directly from your LIS dashboard for there's no available function yet to download or print out that Masterlist. At least, you have a copy of your own learners in your school with their own LRN, name, and status of schooling. Hope this tutorial has served your need. 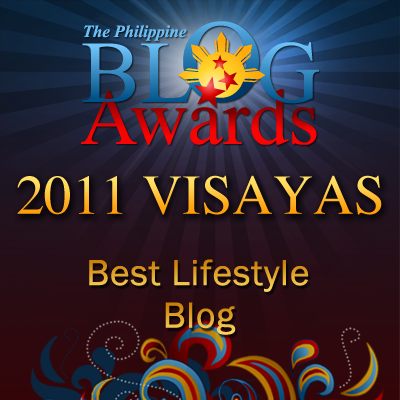 Thank you for visiting this humble site.